I just ordered myself a L.R. Baggs M1 and I really hope it’s as good as people say. I have only tried cheap magnetic soundhole pickups so far, like Artec and Belcat and they worked ok both of them but sounded a bit thin, hopefully the M1 will be more full and warm without sounding muffled or muddy. I have an old Shadow humbucker from the 1970’s that I kind of like but it’s a bit too dark for dreadnought guitars. The undersaddle ARTEC PP-607 I installed in the parlour was way too uneven when played hard, and a bit thin sounding as well. My favourite magnetic pickup is still the old Japanese 1960’s one that my dad fitted in his Levin LT-16. I got the L.R. Baggs M1 new from dont_tell_the_wife_guitars on eBay and it only cost $139.00 with free shipping so I felt it was worth a try. If it’s good enough for David Gilmour then I’m sure it will be just fine for me. I just received my new L.R. Baggs M1 and it looks awesome. Cheap, quick shipping and no customs issues, couldn’t be better. 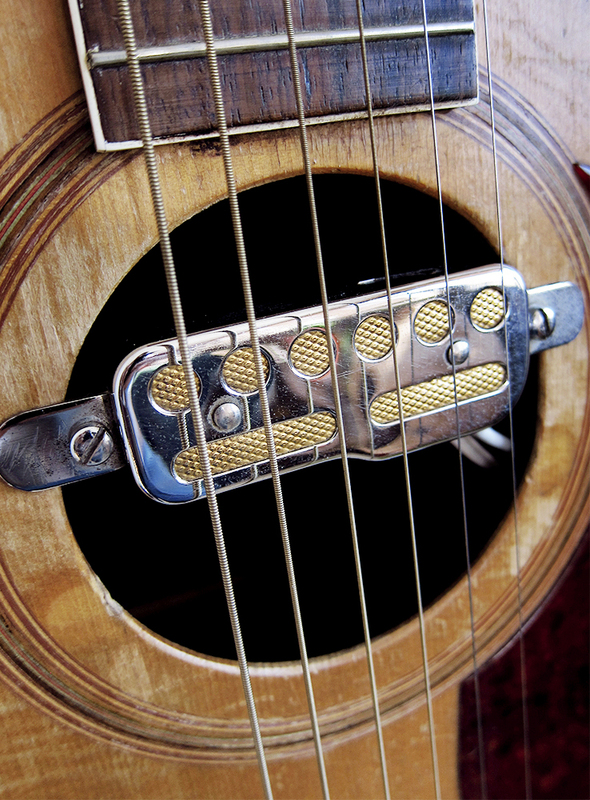 I noticed that the M1 Passive doesn’t have a volume control but I’m pretty sure I can live without since I have never used that on any of my acoustic pickups. I’m really excited about rehearsing with Chest Fever on Thursday so I can try it out loud. I hope it sounds as good as it looks. Last night I finally got to play the L.R. Baggs M1 loud, we had to cancel the rehearsal last week since Araceli’s and I celebrated 6 years together. I fitted it in my Kiso Suzuki WE-150 and it sounded pretty good, well it sounded just like the Suzuki does unplugged. It was the first pickup I have ever tried that could handle my hard hitting solo playing and I’m really impressed with how responsive it is, loud enough when picking and not too loud when strumming. I can’t wait to put it in an even better guitar and really hear it’s full potential.